Greg Sowinski | The Lima News Paul Nusbaum, of Pandora, stands with the bicycle on which he rode across the United States in 33 days earlier this year. He spoke to members of the Ottawa Area Chamber of Commerce on Tuesday about his journey. OTTAWA — Six days on the bicycle of more than 130 miles each, a crash, 40 mph headwinds and several mountains to get over were part of a 33-day journey that took Paul Nusbaum across the United States on a bicycle. Nusbaum was one of 11 who dipped their rear wheel in the Pacific Ocean in Costa Mesa, Calif., and began the 33-day journey across 15 states ending in Amesbury, Mass., where they dipped their front wheel into the Atlantic Ocean. In the end, he was one of three who rode every mile of the 3,470 miles across the country. “I was the oldest rider to do that,” Nusbaum told members of the Ottawa Area Chamber of Commerce on Tuesday during its monthly luncheon. “This was a cause I felt I could work for. The hospice worked with both my parents during their last days on earth,” he said. He told the group about tractor-trailers passing him just inches away, which he believes was done on purpose to scare him. There were numerous road hazards along the way, too, such as shredded tires and metal slivers from tires that contributed to five flat tires he had along the way. Nusbaum and the other riders averaged 112 miles a day with the longest day riding 137 miles, he said. The hardest day was the eighth day when riders ran into 40 mph headwinds and 8,100 feet of climbing. They worked together to take turns breaking the wind and using drafting but still it was a nine-hour day of pain on the bike. The Pandora man told the group the Tour de France, the biggest bike race in the world, covers about 2,100 miles in 23 days. But those riders average about 27 mph compared to the 17 mph Nusbaum averaged. “A little bit different level of riders, too,” he said. Nusbaum is no stranger to cycling challenges. He was among a group of elite riders who rode 260 miles across Ohio all in one day a decade ago. The trip also had its funny moments, although Nusbaum said he wasn’t laughing at the time when he came face to face with a bull blocking the road. As he slowly retreated the bull took off and blasted through a fence, he said. Riders stayed in motels and packed trucks with their gear so they didn’t have to carry it on their bikes. 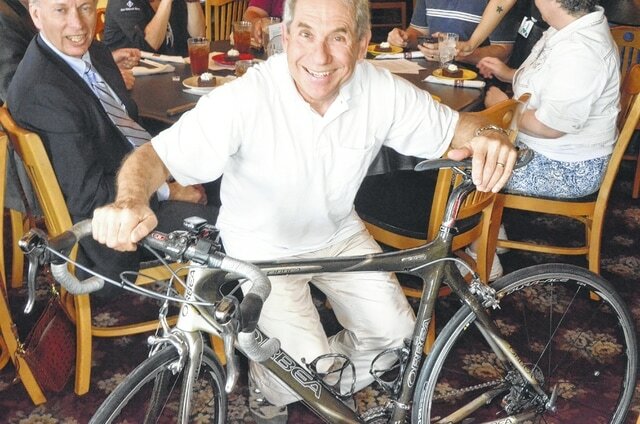 Nusbaum showed off his carbon fiber bike, which he said has more than 50,000 miles. Nusbaum never thought about giving up. It just wasn’t an option but he did worry about a crash or injury stopping him. Several riders crashed along the way and two had to be hospitalized because of dehydration. For Nusbaum, it was his second ride across the United States and his last. He rode a similar fundraiser in 2000 to benefit the American Lung Association. “I probably won’t do it again. After two of these I think I have gotten the long distance stuff out of my system,” he said.